Hi all! 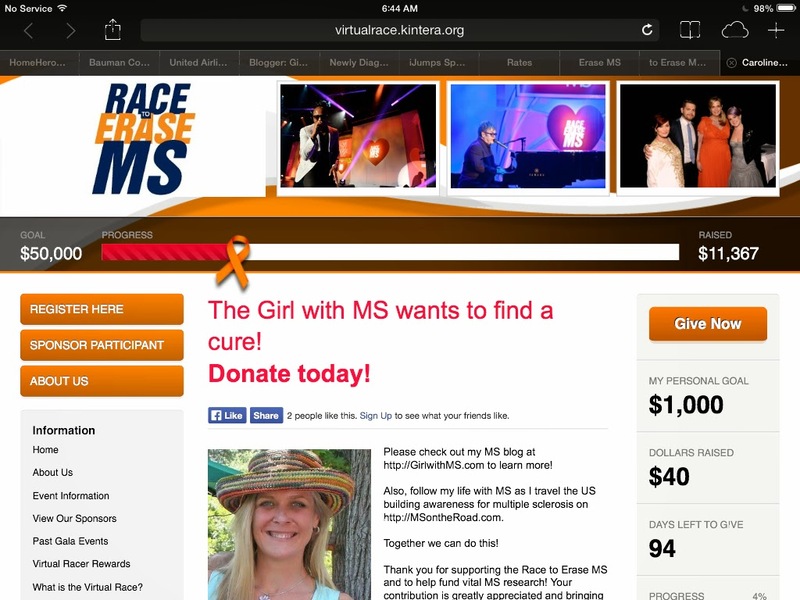 For those not familiar I have chosen Nancy Davis' foundation, The Race to Erase MS, as my charity this year to help raise money and awareness. I'm raising an extra $1000 for this project. While it might not seem like loads of money, it's enough to make a difference and a reachable goal. If all of my friends donated $10 we'd be well over $1000! It adds up quickly. Click here for My personal fundraising page. The foundation raises funds for the Center without Walls program. Click to Learn more. Funded by the Race to Erase MS, the Center Without Walls program (CWW) has provided support that has permitted the medical community to link together multidisciplinary scientific programs and expertise across the country to advance the understanding of the cause of MS and to develop new treatments. The Center is a break-through success because of the vision, insight and flexibility of these extraordinary doctors. The Center’s theme is simple: communication – doctors working together toward a mutual goal. When this goal is reached, all will share in the victory. Keep up the great work Nancy and team! Let's do this!